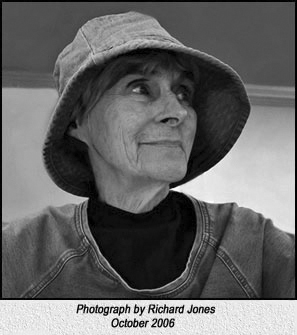 When Rebecca Peck Jones died Oct. 22, 2006, at her home in Riverside, Calif., she left us a legacy of art and wisdom. Using the timeless language of clay, ink, and paint, she translated what she saw and sensed in the world and beyond. But she was fluent in words as well, beautifully-and often humorously-voicing her philosophy of art, spirit, and life itself. "Joy, oh bliss," she would sigh, either ironically or jubilantly, at the unfolding of life. "A bad patch," she would say of any personal misfortune. Becky's essence reaches out to us from her sculptures, drawings, and paintings, particularly those she created of the women, children, and animals of Cairo, Egypt, and Amatenango del Valle, a tile and adobe village in Chiapas, Mexico. Filling sketchbook after sketchbook in Cairo, one concept began to emerge. Becky wrote, "as human beings on this planet, we share many things; a love of beauty, family values, an energetic longing for the 'good life' -in whatever way it might appear as 'our culture' or 'our individual heritage.' "
Becky sought to learn, work, and understand "the spiritual side of life and mud" and to translate these ideas into clay. "I base everything on spiritual development," she said. "I think the bottom line is your own spiritual evolution and how you relate to something that centers your life and is meaningful." Becky was a lifelong Christian Scientist and was influenced by the writings of Mary Baker Eddy, Albert Einstein, Henry David Thoreau and Russian artist Wassily Kandinsky. The following from Wassily Kandinsky's essay, 'The Spiritual in Art,' is to me a truism: "Only that is beautiful which results from an inner spiritual need." In her notebooks and papers, and in conversations with people, Becky acknowledged the influence of Mary Baker Eddy and Albert Einstein on her life and work. Mostly, I work in clay. It talks to me. It's responsive, especially on the potters' wheel. Clay as art is us a discipline of thought and action which, of course, is the basis for a reason for being . . . a coherent design . . . be it life, lithograph or a flower pot. Centering a wobbly hunk of clay on the wheel allows the artist to create a form . . . a vessel . . . like a child with honesty, directness, spontaneity. And like a dance, beautifully! To me it's a metaphor for "the good life." Becky also had a passion for teaching. She first taught at the Telfair Art Academy in Savannah, Ga., now Telfair Museum of Art, which she helped to establish. In Riverside, she taught ceramics and sculpture at California Baptist University and in her private studio. She treasured the time she worked as assistant to Ray Miller, who was art director for the Riverside Unified School District and for the Riverside Art Museum. In working with children, encouragement was the key, not criticism, she would say. Sometimes she illustrated the point by sharing a second-grade teacher's story of a youngster who pounded the piano keys for "show and tell." In recent months, Becky had spoken often of her own education in art, which began as a 12-year-old in New Milford, Conn., with noted landscape and graphic artist Edith Newton. Becky earned her master's degree in fine arts from the prestigious Chouinard Art Institute in Los Angeles, now California Institute of the Arts (Cal-Arts), and studied with such notables as California watercolorist Rex Brandt and ceramic artist Marguerite Wildenhain, who was associated with the avant-garde Bauhaus School in Weimar, Germany, and founded the Pond Farm artists' cooperative in Guerneville, Calif. The Staying Power of Miss Newton's influence on recognizing my life's purpose. One cannot ignore an "idea whose time has come." If we do, a vacuum occurs. In the case of Riverside the present need is room to accommodate the fruits of the artist...an extension of the foundation laid by the developing years and hard work at the Riverside Art Museum, What is the need? An atmosphere, as well as room to expand the education of art in artist and craftsman. We have established pretty much now, the environment, the climate for the viewer to see "the arts." Away from the fruitless attempt to bolster social position by indulging it through the superficiality of covering our ignorance of "what is it" with the empty explanation of "interesting" to a void filling expression of appreciation and understanding for the individual artist and his hard work. Becky made most life decisions for art's sake, even the practical ones. For instance in 2001, she left her beloved "Gopher Grove," the 1-acre parcel in the green belt of Riverside she had shared with her late husband, Sims Jones. Idyllwild was her destination, a village in the San Bernardino Mountains with many artists and art galleries. "Art comes from within, but the environment has a lot to do with it," she said at the time. With a smaller house and yard, she expected to spend more time throwing pots and creating clay sculpture. "I'm trying to compress my duties so I can work more and read more," she said. She was entering her eighth decade and did not want to postpone her creativity. "I'm of that age," she said, but "I'm not thinking retirement, thank you very much." During that time, Becky taught watercolorist Don O'Neill of Riverside how to make pottery, and he inspired her to return to painting. They were married, and Becky moved back to Riverside in 2006. This was a temporary stop on her way to live among artists in a Laguna Hills community. Having returned whole-heartedly to drawing and watercolor, she did not plan to take her kiln. Becky looked forward to living and working among artists: "Joy, oh bliss," as she would say: Good things were coming her way.